This recipe for Crock Pot dressing is so good you won’t even know it didn’t come out of the turkey. 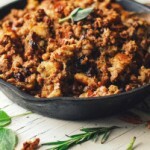 Using a crock pot verses stuffing the whole turkey also saves time in roasting time in the oven by at least 1-2 hours depending on the size of the turkey. Fill the cavity of the turkey with whole garlic, onion, salt and pepper, fresh chopped sage or basil. I like to rub butter under the skin of the turkey. It tastes delicious and the skin gets browned perfectly. Spray crock pot with cooking spray, mix all ingredients and cook in slow-cooker on low for 3 to 4 hours. I save ends of fresh bread and freeze instead of using a loaf of fresh bread. Perfect combination Summer & Turkey! © 2018 Hayter’s Turkey Products Inc.